If you have been in the collection industry long enough, odds are you've had this kind of a call -- a consumer gets so emotionally wound up that they become impossible to speak to, and start spewing vulgarities, or hanging up and repeatedly calling back and screaming. And there's usually a reason for it. I'm not necessarily suggesting that the collector has done something wrong -- sometimes, you've just called at the wrong time. Or perhaps your tone unintentionally set the consumer off. So what do you do now? If you failed an exam, didn't pass your driving test, got a speeding ticket, missed handing in your homework, or didn't take out the trash, you couldn't lash out and scream at your teacher, policeman, or parent, so why should anyone think that yelling at a collection agent will make a debt vanish? Really, it's not about emotions, it's about authority -- the first thing you need to do is calm everything down, give the consumer options, but establish your authority position. You cannot re-establish authority by yelling, by threatening, or by responding with emotion. There's a right way and a wrong way to calm things down. Sometimes a consumer think (or have learned from personal experience) that an emotional reaction resolves issues. If they scream at you and become difficult, you will go away. Or if they can evoke an emotional response from you in return 'they've won' -- which would be correct. They would be in control of the conversation. For these reasons, you need to keep your cool. "Frank, I appreciate you are very emotional about this debt. I want to work with you, but we can only discuss this business issue when we are both able to talk about it rationally. Can you take a deep breath and work with me here, or do you need a day to gather your thoughts and financial information and call me back?" 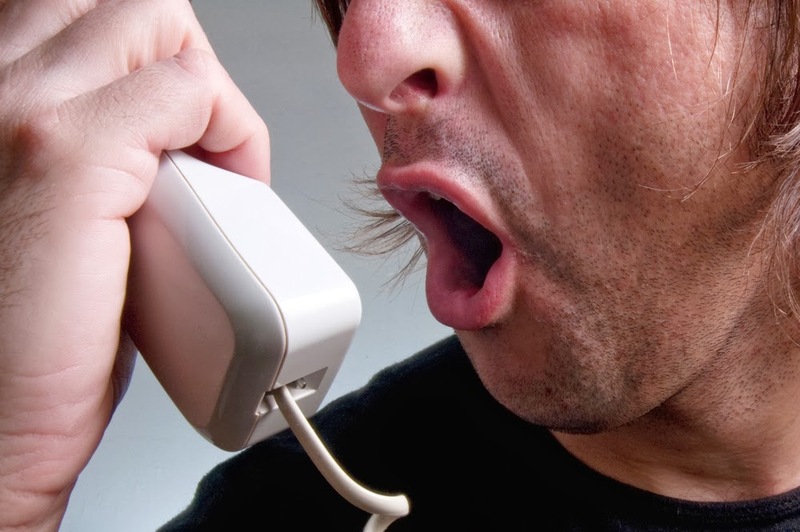 Another situation that can happen is a consumer can call your office back over and over and over, irrationally shouting or making demands. The most important thing you can do is answer the phone, put the issue back to a choice for the consumer, and regain control of the situation. "Mary, you have called my office five times in the last half hour. Obviously you are concerned about your debt to ABC Bank. As I said in the first call, we need to determine if you are going to cooperate on this. Your actions seem to indicate that you aren't capable of making arrangements. Shall I report this to your credit bureau this afternoon, and we can conclude our conversation?" Whatever you do, don't route the call to a supervisor, don't avoid the call and let it go to your voice mail, and certainly don't react emotionally showing frustration to the consumer. If you do any of these things, you are in fact rewarding their behaviour by giving them a potential response they are looking for. Stay calm, and be patient! However, if the call is going nowhere, by all means politely terminate the call. If a call starts slipping into chaos, take a quick second and be honest -- could you have overstepped some boundary or set the customer off? Did you sound too aggressive, or cut the customer short, or not show appropriate empathy for their situation? "Allan, it's possible that we got off on the wrong foot here. It's not my intention to upset you -- in fact, this is a courtesy call to try to reach out and work out this matter amicably. Let's try starting over. As I first mentioned, my name is John Jones and I'm calling from ABC Collections on behalf of XYZ Corporation ..."
Sometimes, advice that you need to stay calm is all well and good, but every once in a while, a debtor can push a button and upset even the most experienced collector. If you find yourself losing your cool, or actually getting angry, you need to end the call as professionally as possible, and go take a five minute walk and calm down. No call is worth throwing out your professional demeanor. Walk it off, and move on. If you are unable to deal with a consumer constructively, it's time to take action, escalate the file to the next step, or even just have it moved to someone else. We are in a business of collecting on accounts, not emotionally slugging it out with customers. It's not worth it to your well-being, your company's reputation, or the reputation of your client the creditor. Everyone who has been in the collection business has a story of a collection account gone awry. Going back almost 20 years, I was dealing with an escalated call from a provincial professional sports celebrity who got so upset that we had the audacity to call him, he actually showed up at our collection agency office. He was incredibly angry about his $400 cable bill, and demanded to see me in person. So I went out to the lobby and met with him. He could have picked me up with one arm. After five minutes of taking the 'let's start over' approach, showing him a copy of the statement from the cable company, and explaining we could have affected his credit bureau without calling him, I had him calm enough to make his own decision on the file -- I told him we never had to talk to each other again after that day, but what happened tomorrow depended on his decision. He paid the bill, and shook my hand. Anyone have a story about an emotional debtor, and how they managed to calm them down?